Located on Hoover Ct just off Montgomery Hwy, Extra Space Storage serves residents of Birmingham near Hoover, Wine Ridge, Vestavia Hills, Indian Springs Village, and more. Locals will recognize our facility behind Wells Fargo Bank across from Tameron Hyundai. Extra Space Storage on Hoover Ct offers a wide range of storage units, climate-controlled storage, vehicle storage, and exceptional security. We're the storage partner you can count on in Birmingham near Hoover! Find storage units as small as 3x4 and as large as 10x45 with features like indoor access, drive-up access, and first-floor access. We can accommodate both residential and commercial storage needs! Our Birmingham storage facility is equipped with security features like 24-hour video surveillance and electronic gate access, providing peace of mind and a safe storage environment for customers. Protecting sensitive items from extreme heat, humidity, and cold is easy at Extra Space Storage in Birmingham! With climate control, your unit stays comfortably between 55 and 80 degrees at all times. Looking for secure vehicle storage in Birmingham? Our Hoover Ct storage facility offers large outdoor parking spaces to handle everything from small cars and motorcycles to large boats and RVs. Do you need an affordable office space in Birmingham? Extra Space Storage offers office space for rent! Store commercial inventory and work from the same convenient location. Contact our staff to learn more! When you choose Extra Space Storage, you can expect an incredible self storage experience. With a well-maintained, secure, clean facility and a friendly, professional team, we go the extra mile to ensure your needs are met. Contact us today to reserve a storage unit in Birmingham! Thank you again Miss Terry, I really appreciate you going out of your way to make me feel comfortable! You gave me the best option, the best price and unforgettable service!!! Thank you!!! This is a great facility in a convenient location. Safe, climate-controlled, and indoor drive-up option makes it a go-to for year-round access to your stuff. Multiple tiers of security gates/cameras keep your storage secure and the price is hard to beat! Terri was great. She found me the perfect unit for what I was storing. She was a joy to work with. Drive south on Montgomery Hwy. Pass I-65 and continue south. 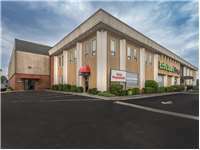 Our facility will be on your right behind Wells Fargo after Braddock Dr.
Drive north on Montgomery Hwy. Pass Riverchase Galleria and continue north. Our facility will be on your left behind Wells Fargo after Deo Dara Dr.
Drive west on I-459 S. Take Exit 13B. Keep right and merge onto Montgomery Hwy. Pass Deo Dara Dr and continue north. Our facility will be on your left behind Wells Fargo. Drive east on I-459 N. Take Exit 13. Turn left onto Montgomery Hwy. Pass Deo Dara Dr and continue north. Our facility will be on your left behind Wells Fargo.